Our brushed chrome wall phone returns to the wall in this Henry Dreyfuss tribute. 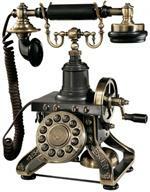 Dreyfuss, considered a brilliant industrial designer, worked with Bell Telephone Laboratories designing telephones that would suit a variety of home environments. Well-known for the 302 Desk Phone, he later shifted his design efforts to include this wall unit that allowed consumers to walk with the phone while cradling it on their shoulder. This unified and balanced form replaced the awkward shapes of earlier models. Would you believe Dreyfuss actually used measurements from over 2,000 faces to determine the average distance between the mouth and ear? 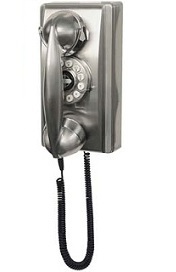 Our brushed chrome wall phone features the nostalgic rotary dial but actually functions with push button technology. No more waiting for that rotary dial to make its slow rotation. Dimensions (L x W x H): 5" x 10" x 6"; 4 Lbs.